If you’ve gotten this far you probably know that I Am Legend is a Vampire movie about the last man (almost) left alive on earth. It stars Will Smith as Robert Neville, a military scientist-type who has taken it on himself to find a cure and vaccine for a disease caused by a drug once thought to be a cure for cancer. Instead, it actually wiped out 90% of the human race (oops). That drug was developed by a woman scientist played in a cameo uncredited role by Emma Thompson. It took only three years for the hero drug to end up as the plague, and the film essentially begins at that point. I went to see this picture primarily because I love to see big cities silent and empty. There is something eerie about it, as if you are in Rome, surveying the ruins of a lost civilization, but you have actually walked those streets. It transports me back to my childhood and my fascination with science and fiction. 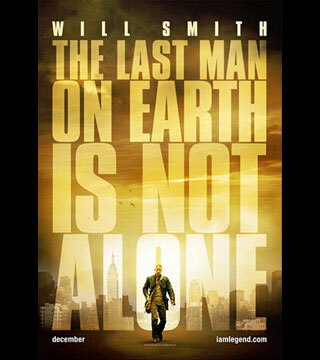 I Am Legend is based on Richard Matheson’s 1954 novel (same title) and this is the third adaptation of that story onto the big screen. The first was The Last Man on Earth (1964) starring Vincent Price, then again in 1974 with Charlton Heston playing The Omega Man. Of course I saw those films on television, as well as The World, The Flesh and the Devil (Harry Belafonte). The images of barren cities are forever etched in my mind. Mr. Smith turns in a fine performance and is able to carry the story by himself, displaying both drama and comedy through a deserted, post apocalypse New York. According to the production notes (download pdf here), he prepared for months both physically and emotionally to take on the role, and it shows. Robert Neville’s military training has come in handy, helping him construct a fortress in Washington Square. It’s outfitted with blast doors, power generators and an impressive lab in the basement. All of the citizens of New York (and the rest of the world) have perished either through breathing the virus or being killed and eaten by the less fortunate ones who have become zombie/vampires. Mutants who cannot survive in daylight, have lost all notion of “typical human behavior,” are super strong and quite nasty. Lt. Colonel Neville attempts to construct a typical day in his new atypical world. Eat, exercise, make a selection at the video store, flirt, shop, garden, even visit The Met. His house is adorned with original art–a Van Gogh hangs above his plasma flat screen in the living room. I would have done the same thing. No strike that, I would have moved into The Met. But Robert does something I probably wouldn’t have. He captures mutants and takes them to his lab for clinical trials in an effort to find a cure. He has been unsuccessful. Robert has a close and only companion in Sam, a German Shepherd. Sam is child, wife (Samantha), friend and confidant. Sam is attacked by mutant dogs when Robert gets caught in a zombie trap he originally used on them, and barely escapes. He snaps and goes out at night to rundown as many mutants as he can. They actually overpower him and he is saved in the nick of time by Anna (Alice Braga) and her son Ethan (Charlie Tahan), who have heard his broadcasts over the airwaves. Anna provides Robert with the human inspiration that has been missing for so long. An all out attack is mounted by the vampires, with their alpha male in the lead (played with raw power by Dash Mihok). Good and evil have a final showdown, while hope and the future of the human race hang in the balance. The director, Francis Lawrence, effectively injects flashbacks, giving us some perspective into Robert’s drive and motivation. But for me it is all too expected. The pieces fall into place too easily. Technically the film is first rate. The dialog (monologue mostly) is engaging and Mr. Lawrence’s pacing keeps the story hurtling forward. So many details are right, but in the end, the film doesn’t rise beyond a routine science fiction thriller. 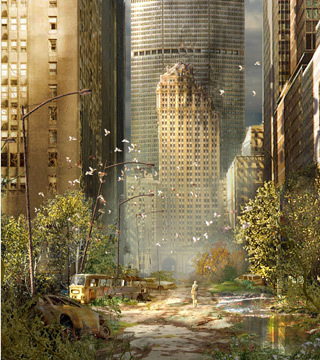 I Am Legend is interesting to watch for you sci-fi fans out there, and the official web site has some cool features, like an interactive map of New York and a daylight meter that you can customize to your own zip code. But it will work just as well at home as a rental, especially if you have a good entertainment system. One thing I kept thinking about during the picture. Free rock star parking anywhere in New York. Sweet. Thank you. I customized the blog theme called “Headlines” by Woo Themes. Hope you find one you like.